The customer lifetime value (CLV) concept is extensively changing the way today’s business is managed. A student or practitioner needs to understand CLV to best gain the competitive edge in business. Customer Lifetime Value: Reshaping the Way We Manage to Maximize Profits is a text that shows in detail how managers and researchers can best use CLV to a business’s advantage. This valuable resource explores various practical approaches to the measurement and management of customer value that focus on maximizing profitability and growth. Leading thinkers discuss how to leverage CLV in all aspects of business, including customer management, employee management, and firm valuation. Everyone needing to prepare a business for success in the future should read this book. Most books on the subject only cover separate components of CLV and are typically limited to targeting for direct response marketing. Customer Lifetime Value presents all components, cohesively putting them together into an understandable functioning whole. This source prepares forward-looking managers and researchers for the inevitable change and provides strategies to gain and sustain the competitive advantage. 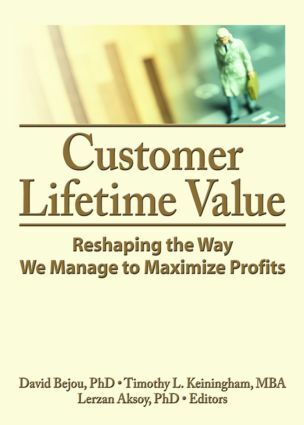 Customer Lifetime Value: Reshaping the Way We Manage to Maximize Profits is essential reading for practitioners in the areas of customer satisfaction, loyalty, CRM, and direct response, as well as academics in the service marketing area.